It's a very special day, so be sure to celebrate in a fun way! Your son or daughter's first birthday is a day to remember, and the party decorations will make a big impression. Use the 1st Birthday Hot/Cold Cups in your party tableware for a colorful selection. With this bright tableware, you can decorate with party balloons and confetti in an array of colors! 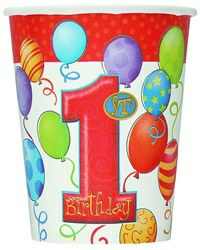 The 1st Birthday Hot/Cold Cups will make your clean up easy and quick at the end of the day which is always a plus!